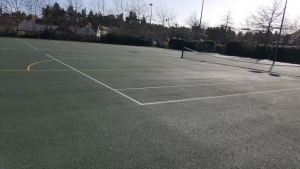 Our courts have been resurfaced and are now an ideal floodlit venue for tennis and netball. 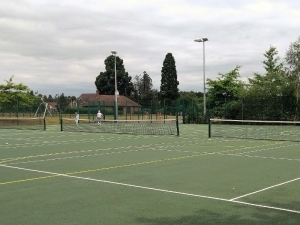 There are three floodlit tennis courts available which can be hired individually. It is also possible to hire the whole area, which is suitable for team sports such as netball and five-a-side football. 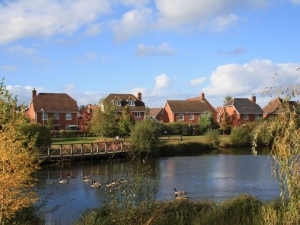 The area can also be floodlit during the evening for an additional charge. You can use the online system to check availability of courts. To book a court, or if you have any questions, please ring the office on 01252 819204 during office hours (9am to 1pm Monday to Friday). Weekends and school holidays. You can book courts online from 9am to 8pm on the day you wish to play and you will be sent a confirmation email with a one-off entry code to access the tennis courts. 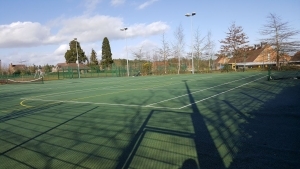 During the week you can book tennis courts through the office between 9am and 1pm on 01252 819204. The cost of a court is £5 per hour.